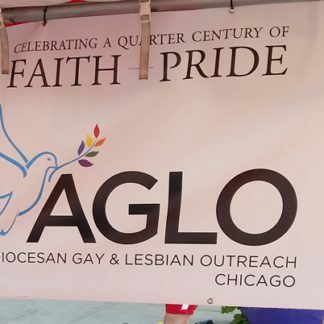 AGLO Chicago #109Y Catholic LGBTQ outreach • Condren Galleries Ltd.
AGLO Chicago #109Y images with JPEG & PDF scans and prints by artist Stephen F. Condren, BFA-SAIC, of Condren Galleries, a Fine Arts Gallery. Because AGLO is good, it’s mission is good. This excellent program is taking a positive stand for meeting the Spiritual needs of the LGBTQ Community in Chicago. The program is run and operated by a staff of volunteers and under the guidance of the Archdiocese of Chicago. AGLO Chicago ~ Our Lady of Mt. Carmel Church, 708 W. Belmont Ave., Chicago, Illinois 60657. 773-525-0453. AGLO Mass ia at 7:00 pm, Sunday evenings.